Janesville Receives Grant for Town Square | Vandewalle & Associates, Inc.
FROM WWW.CI.JANESVILLE.WI.US: The City of Janesville received notice from the Wisconsin Department of Natural Resources (DNR) that another grant has been awarded to implement Town Square riverfront improvements in downtown Janesville. The $342,902 Knowles-Nelson Stewardship Grant will be used to realign the Ice Age Trail and create waterfront accessibility improvements and other recreational enhancements. This most recent grant is received in addition to several other grants awarded in 2016 that will lessen the financial obligation the City shoulders for completion of the Town Square. 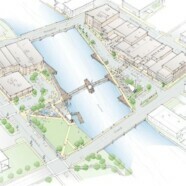 Removal of the downtown parking plaza over the Rock River, which is currently in progress, and the subsequent creation of the Town Square is consistent with the City’s ARISE strategy fueling growth and economic prosperity in downtown Janesville.